David Rowell, M.F.A., assistant professor of sports, arts and entertainment management, served as a professional development faculty member, mentor, consultant and volunteer Sept. 24-28 at the 2017 Performing Arts Exchange Conference in Atlanta. This was Rowell's 19th year attending the PAE conference. 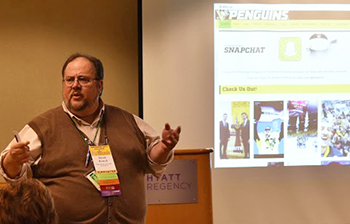 At this year's conference, he taught and moderated two of the panel sessions titled: "Social Media Nuts and Bolts" and "Current Trends and Hot Topics in Social Media and Mobile Marketing." Additionally, Rowell served as a FaceTime consultant on social media marketing for performing arts, meeting individually with presenters, artists and booking agents/managers to discuss ways to enhance their social media and marketing techniques. Rowell was also a mentor for professionals new to the industry and the PAE conference. "Mentoring is one of my favorite things to be involved with - getting to know and work with new colleagues is outstanding," Rowell said. Two of the attendees at the "Social Media Nuts and Bolts" session offered the following comment about Rowell: "We had the pleasure of attending social media seminars with David Rowell for the past two years at the Performing Arts Exchange Conferences and also participated in private coaching time with David after his seminars," said Bruce Ewing and Lucas Ranel from Phat Pack Entertainment. Ewing and Ranel added: "With David's help, we have developed an online social media presence and focused on the audience which is best for our productions. David also coached us through the development of our electronic media kit, which has helped us to get the attention of many presenters and helped our show to get many more bookings!" In January 2018, Rowell will be attending the Association of Performing Arts Professionals International Conference in New York City with 12 Point Park University SAEM majors, who will serve as student volunteers at the event.